Hiking with my dog is one of my favorite outdoor activities. Watching her have fun makes the experience all the more rewarding for me. I got lucky with this dog, because she has turned out to be an excellent hiker. What does that mean? She stays on the trail, usually between my friend, who likes to lead, and me. (I like to take a more leisurely pace.) If she gets too far ahead of me, she’ll stop and wait for me to catch up. If we encounter people or dogs, she will ignore them. Perhaps most importantly, when I call her, she comes to me, a behavior I reinforce with occasional food rewards. That said, it should be remembered that not everyone likes dogs, even well-behaved dogs. Unfortunately, many times the dogs we encounter in the woods are large, exuberant animals who jump up on people, something that is uncool in the extreme. Then what happens is people begin complaining about ALL dogs on hiking trails. 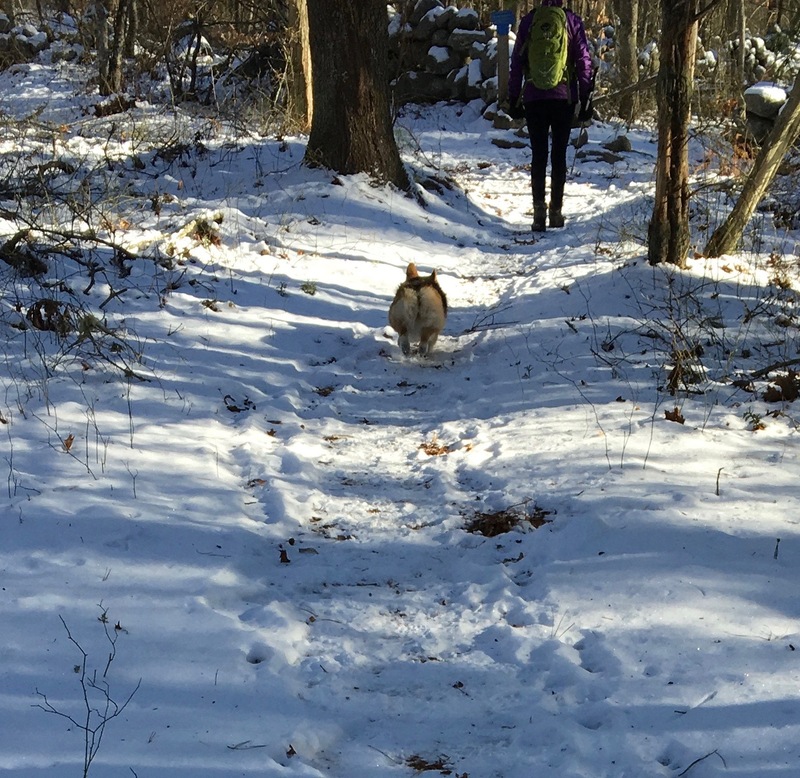 Here’s an excerpt from Auntie Beak’s blog about a recent hike on Barn Island, CT, that sounds as if it was spoiled by an abundance of annoying dogs. 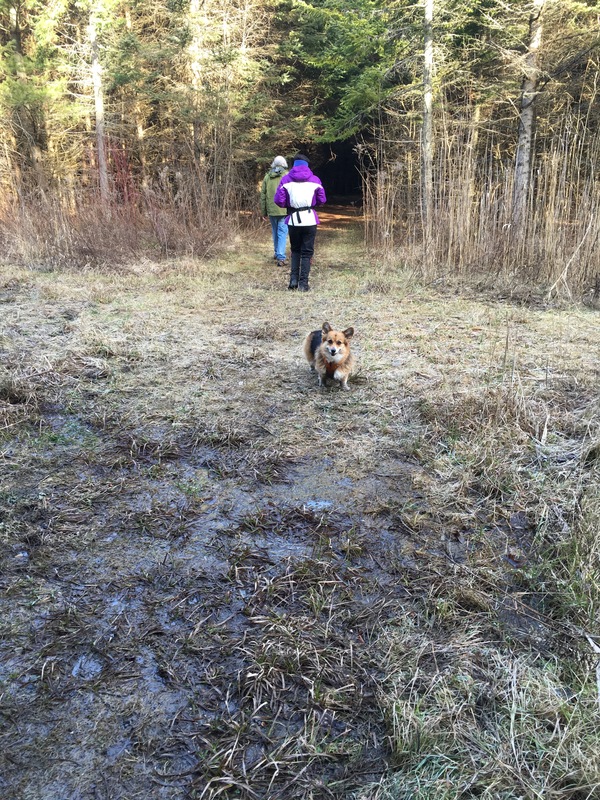 Dogs must be leashed at all times, except when being used by licensed hunters while hunting small game and waterfowl. Is it really still necessary to re-state the obvious? I guess it is, with unleashed Great Danes “mobbing” frightened hikers. It is always up to dog owners to ensure that their pets do not annoy or scare other people. This is especially true in the woods, where trails are narrow and you have to pass fellow hikers in close proximity. In those situations I almost always leash my dog, and that leash is hanging on my belt at the ready, just in case. The bottom line with hiking and dogs is this: no one, even a confirmed dog-hater, will object to a quiet, well-trained dog on a trail. Everyone, including confirmed dog-lovers, will be annoyed by untrained, in-your-face dogs on the trail. The difference, as always, is the dog-owner. What a fine hiking companion you (the owner) have created. Such a relief when dogs behave. I agree. Dog-owners need to respect others on the trail.